KinderWiser: How to embed innovation in your organization? How to embed innovation in your organization? This was my topic last week, speaking to a group of executive MBAs during a seminar focused on entrepreneurship. Innovation is a new and relevant answer to an important question. But once you have deciphered the "Mystery" of unnamed or unknown desires leading to your unique Offer, when you have found your entrepreneurial Heuristic pattern and finally designed a robust and attractive Algorithm, exit innovation; you enter the daily “raison d’être” of all businesses: reproducing the formula, the solution, at the lowest cost and the highest profit, as long as possible. Even though we all know that in the future we'll have to make changes we are not willing to reopen everyday the Pandora Box of Inquiry. Keeping innovation alive in an organization built for execution implies that essential questions, emerging or unknown are "routinely" identified and "processed" to keep creating and implementing innovative solutions. A "double-bind" challenge. Over a few decades of management practice, I tried to overcome this "double-bind", eager to combine the chaos of questions with the dull order of repetitive solutions. Amid some successes and numerous failures, I eventually discovered three essential "ingredients", tightly linked to each other. First, People: Do you see them -do they see themselves - as the prime source of innovation or just silent performers of pre-established processes? I engaged my "authority" to allow everyone to be a potential "author", not just a docile instrument or scape goat for every problem; I went on suppressing information barriers and hierarchical walls, facilitating dialogue and initiative, giving time and space to breathe, think and relate, even introducing Art to the shop floor! But along the way, I discovered that this "humanistic" and inclusive approach was incomplete: good intentions, great values, deep empathy and inspiring declarations are short-lived if not rooted in reality by a strong purpose. Purpose is the second ingredient of embedded innovation: if we - the people- are the key to innovation, we must work together on it, addressing and solving the quintessential question- the what and the how of our "raison d'être"- which will keep us ahead of the game. But in business,unlike school, problems and issues are not given, they emerge,or not, are solved, or not, reinforcing or destroying the organization's life expectancy. We need to be on the outlook, open to discovery, ready to learn and unlearn to innovate. For this, we took the "organizational learning" road: fighting mental models entrenched in routine, valuing curiosity, fueling team learning, world cafés and open forums to develop collective intelligence. 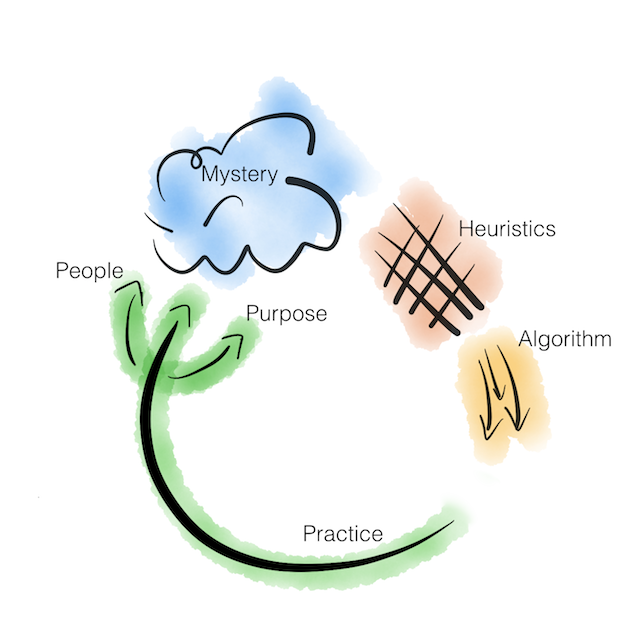 But I discovered that if our learning purpose was key for innovation, it was difficult to "engrain" in everyone's activity, everyday: our learning moments were mostly off time and off site; besides,too often we were not addressing the real issues: we were learning what we wanted to learn, not what we needed to learn. We were missing the discipline (everyday learning for everyone) and the alignment (addressing our "raison d'être": better customer value at a minimum waste); we were missing a common "innovation & execution" Practice, the third ingredient: learning tools, rites and behaviors which are helping people to find and solve the right questions, leading to wiser solutions and frugal innovations. We developed this practice rooted in daily respect for people as authors and constant focus on the purpose of "necessary" learning. Young startups and reputed leaders call this practice "Lean". A practice for people with purpose. You're here to change lives!